Located in the heart of downtown Takayama, the BEST WESTERN Hotel Takayama offers the comfort and convenience you are looking for. We are located within walking distance from all major tourist attractions, shopping centers, convenience stores with banking machines, post office, city hall, bus terminal and JR Takayama Train Station. Our attentive, bilingual staff takes pride in providing personalized service. Each of our rooms feature amenities such as AM/FM alarm clock, hairdryers, coffee and tea services to get your day going, desk/work areas, fax and modem connections, to keep you working, not to mention remote controlled cable televisions and mini-bars for after the day is through. 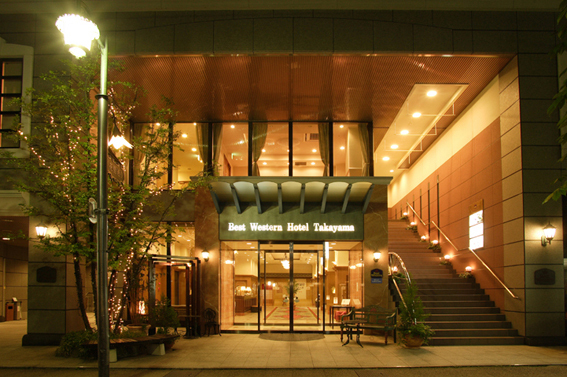 Whether in Takayama for business or leisure the BEST WESTERN Hotel Takayama is the place to stay. Enjoy its position as the preferred place to stay in downtown Takayama for both business and leisure guests. The hotel is strategically located, within walking distance of all major tourist attractions, shopping centres, convenience stores, city hall and bus terminal and JR Takayama Train Station. The hotel's attentive, bilingual staff prides itself in offering personalized and heartfelt service.